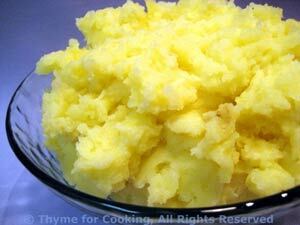 Garlic Mashed, Thyme for Cooking restaurant favorite, easy to do at home. Bring to a boil over medium heat. When boiling (and pay attention or they will boil over) reduce heat and take cover partially off. Continue cooking until done, 20 - 25 minutes. They should be very done, easily coming apart when poked with a fork. Add enough of the garlic/milk mixture to get your desired consistency. If, after adding all of it, the potatoes are still too stiff just add more milk. While potatoes are cooking mince or press the garlic. Heat butter in a small pan over medium-low heat. Sauté garlic until soft, being careful not to let it brown. When tender add the milk. Keep warm until ready to use in the potatoes.